Finally got my car tuned and i was amazed with results..as much as i dont wanna get too caught up with dyno numbers,but considering how dyno dynamics usually show lower numbers, my car still came out with 231whp and 161tq..
Last edited by princeTW; 02-12-2017 at 07:53 PM..
Having trouble uploading pic..working on it lol.. Damn bro that's pretty high numbers . I have basically the same thing and I only came out with 212WHP and 143 TQ. I wonder how you got such good results ! Cheers ! Now i just need to freaking figure put why flickr isnt letting.e post my pics..smh..
What Engine Management are you using? K-Pro? What SRI are you running and Octane? Sweet Numbers dude! Can't believe with bolt on you're making that much whp!!! Last edited by princeTW; 02-13-2017 at 04:25 AM..
What altitude and weather on the day of the dyno? Altitude can make a pretty big difference from one car to another. 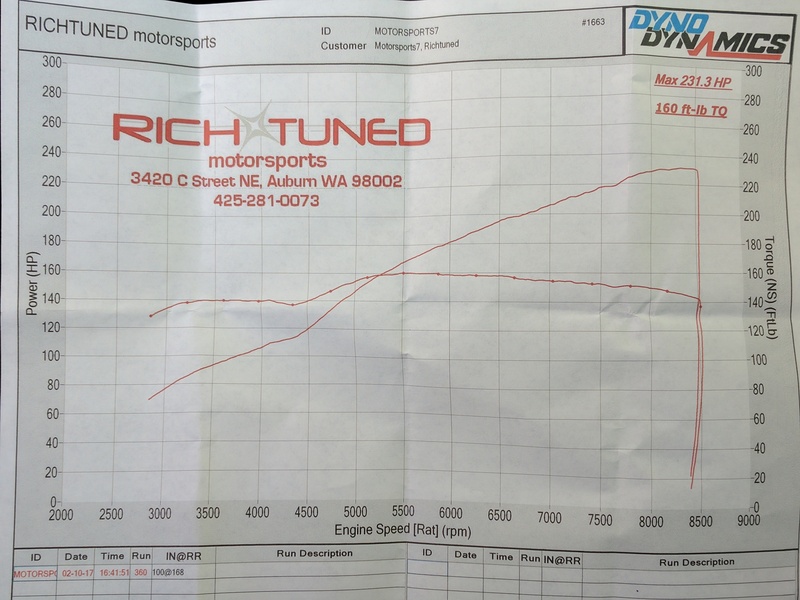 Honestly I think that dyno is reading high, especially because you're running a 2.5 exhaust. Like you said though don't get caught up in numbers, it's all about how the car is running. I agree...i mostly care about the tune itself...Rich is a good tuner...After each WOT pull, he broke it down with me on power curves and what adjustments he was making...The car runs awesome..theres power everywhere...vtec is set at 4000..i'm planning to go do a couple pulls on dynojet and see the difference...i will update then..
Will do..as soon as i can..
Thats not too bad here are my numbers from an all motor 06 type s with basic bolt ons. I think it comes down to how good the tuner is. Those are really high numbers for a K20. I got a few more mods coming, gunna try and get closer to 300 hp. I hope those mods are boost.